Ford Field, a large sports stadium in downtown Detroit, Michigan, is home field for the National Football League’s Detroit Lions. Construction was completed in 2002, with seating for 65,000 football fans and additional seating provided on the field surface for other events. By late 2015, stadium management had determined that a complete refurbishment of stadium amenities was in order, including essentially all AV systems. With a budget of over $100 million, the facelift would include the sound system and video displays along with updates to the suites and premium club areas. The new audio system was designed to address shortcomings that had plagued the original installation. Speech intelligibility and music power had suffered over the years, a situation reflected in complaints from fans in surveys and focus groups. Coaches and front office staff often complained that they could not understand officials’ calls on the field. Troubleshooting the old system was problematic as there was no comprehensive, computer-based diagnostic monitoring. In addition, there was no coverage on the playing field – highly desirable to pump up players in warmups. Rental systems were needed to cover the field for special events in the off season. 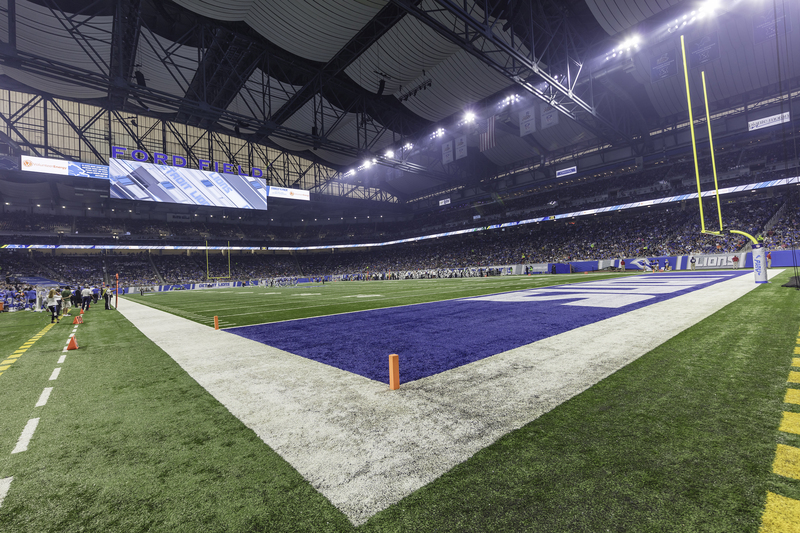 To remedy all shortcomings and boost power and performance to league-leading levels, stadium management selected a LEO Family system from Meyer Sound – the first in any NFL stadium. 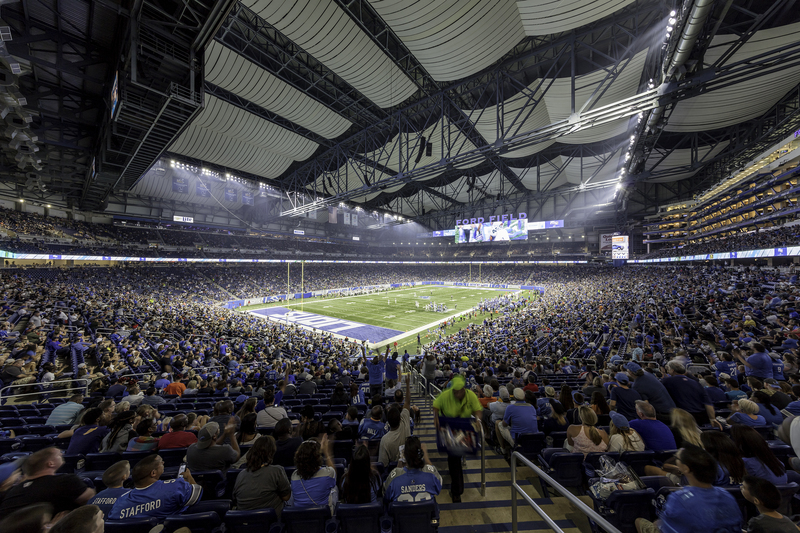 Using the same loudspeakers as touring concert artists such as Metallica and Ed Sheeran, the Ford Field system possesses the wide dynamic range required to deliver clean, uncompressed and undistorted sound even during bursts of peak ambient crowd noise. Because the voice characteristics remain clear and natural, intelligibility remains high without sounding annoyingly loud. Extended dynamic range also enables greater flexibility in programming music and effects for climactic moments as sound doesn’t have to be heavily compressed to prevent system overload. 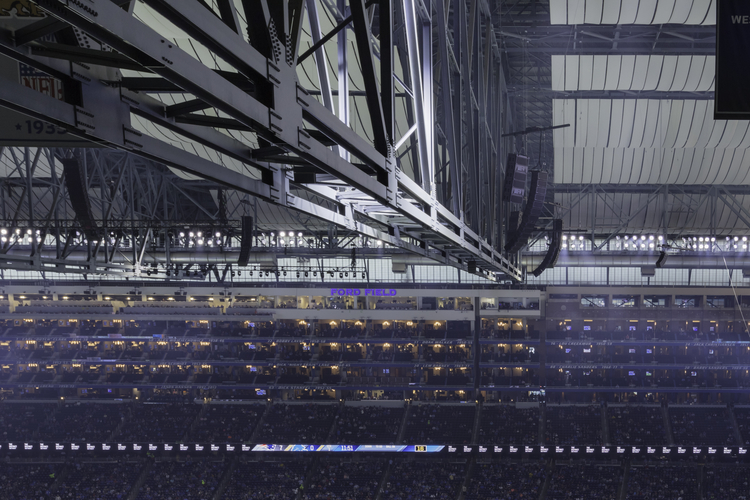 The main bowl system is anchored by a distributed ring of eight LEO Family line arrays, with a total of 100 LEO and LYON self-powered loudspeakers covering the majority of seating areas. Augmenting the main arrays are scoreboard delay arrays and corner fill arrays with an additional total of 36 LEOPARD compact linear loudspeakers. For deep bass music and commanding special effects, 24 1100-LFC low-frequency control units are deployed as cardioid arrays to provide directional control for convincing impact both in the bowl and – when a special preset is selected – also on the playing field. A separately addressable system of 18 LEOPARD loudspeakers blankets the playing field with high-level sound. Outside the main seating bowl of the stadium, in the acoustically problematic atriums at gates A and G, audio is delivered by pairs of Meyer Sound CAL column array loudspeakers with advanced beam steering technology, enabling precise control to minimise reflections from the expanses of glass and metal. Daktronics of Brookings, South Dakota provided a new video system with more than 26,000 square feet of displays, including new end zone screens measuring 39.5 feet high by 152 feet wide and featuring a 13HD pixel layout for crisp imagery and wide-angle visibility. Flanking the main displays, four additional displays measure 13 feet high by 59 feet wide (with the same 13HD pixel layout) can be used individually or coordinated with the main displays for one continuous 270-foot presentation to show live video, instant replays, graphics and animations, and sponsorship messages. Also installed were two super column displays measuring 36.5 feet high by 62.5 feet in three large ribbon displays along the fascia of and an additional four ribbon displays along the seating fascia for a total of more than 5,000 feet in length. The video portion of the main bowl renewal was a separate contract with installation by Daktronics. Although phenomenally popular in the USA, the National Football League has a relatively short playing schedule compared to most other sports. Including pre-season games and – if the team is successful – post-season playoffs, each team’s stadium hosts no more than 12 home games a year (13 only if also pre-selected as the Super Bowl site). Therefore, stadium operations must be able to accommodate a wide variety of other events to maintain economic viability. This reality was a key consideration in the design of the audio systems. The system is zoned so that sections of the main bowl loudspeakers can be muted. Coupled with the separately addressable on-field system, this `allows the sound coverage to be custom tailored to any event. This flexibility is particularly important as the stadium is built into the side of a vintage warehouse now converted to offices. If the entire system is activated it can be distracting to office occupants, but with the new system the precise control of both system zoning and loudspeaker directionality allows rental of the stadium for events during weekday office hours.